1.) Place the aquarium on a very sturdy piece of furniture or preferably on an aquarium stand, especially for larger tanks. Water weighs eight pounds per gallon and when all the equipment, rock and substrate is added on, the tank’s weight can be considered anywhere from nine to ten times the size of the size of the tank, so a ten gallon tank weighs ninety to 100 pounds. If placed on furniture, it may be best to place a piece of plexiglass on top first as some water will end up around the tank due to water changes and so on. This also means that any furniture used should not be an antique or family heirloom as it may be damaged if used as a tank stand. If the tank is being built into a wall or other area, make sure you have plenty of access space at the top and bottom to get to equipment easily, do water changes, and so on. 2.) It is best to locate the tank away from any windows so direct sunlight cannot hit the glass as this will cause algae blooms and in some cases may heat the tank too much. If it is a larger tank, be sure the floor underneath can handle the weight (see step one above). Another important point in deciding where a tank should be located is to place it where you will get the most enjoyment out of it. Set it up in a room where people tend to congregate, such as a TV room, and not so out of the way that it cannot be seen easily. Note that once tanks are filled with water, they should not be moved unless all the water, rock and/or décor, along with most of the substrate is removed first. 3.) The tank should be level, both in its length and width, before being filled with water, substrate and any rock or decorations. 4.) Most saltwater substrates including live and on the market do not need to be, or should not be if it is “live”, rinsed off before placing in the tank. The exception is any substrate that has a lot of dust such as crushed coral. If the substrate does need to be cleaned, it can be placed in small amounts into a strainer and washed over with plain tap water until no dust is left, or some can be put in a bucket and filled with tap water. As the water goes into the bucket, the substrate can be swished around and around and then the water with the dust in it can be poured out and more water added until the substrate is clean. 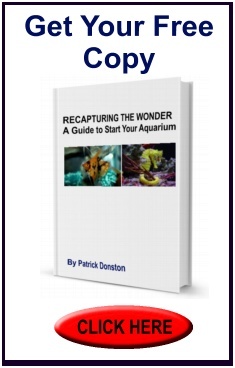 Sometimes it is best, especially with finer substrates, to have water in the tank first (and conditioned “live” – see step 5 below). To keep finer substrates from completely clouding up the tank, cut a corner from the bag and place the whole bag in the water with the opening near the bottom so the substrate pours straight out onto the bottom glass area. There will still be some cloudiness even with this method, but it will be much less than if the fine substrate was poured in the tank from above the water. If a coarser substrate is used, like crushed coral, it can be put in the tank first before the water, but be sure you are pouring it close to the glass at the bottom and not from a high point where it might damage the tank. Spread the substrate out into fairly even layer of approximately one half to one inch across the whole bottom if live rock is not being used. If live rock is being placed in the tank, then it should go in first before the substrate and then push the substrate around it as it is better not to have any, or very little, substrate under the rock. Since the rock is “live”, it needs to be placed in a tan filled with conditioned water (not up to the top to allow for the rock) that is the correct temperature and salinity just like the live sand. 5.) Begin filling the tank with water if not done in step 4 already due to use of live rock. Note that it is usually easiest and best to put the water, water conditioner and salt in and have the filter, heater and any other equipment running overnight before putting in live sand and/or rock. The water placed in the tank should not be too hot or cold but just slightly above room temperature (around 77 to 81 degrees F). If you use a bucket (or buckets to fill the tank, make sure it is a new bucket that has never had any soap products in it as even a small amount of soap can kill fish and invertebrates. A thermometer can be used at the sink so be more exact if the thermometer is one that does not get stuck to the outside glass of the tank. If it does, stick the thermometer on the tank, preferably toward the side and low in the front or on a side glass panel where it can still be read easily, and watch it as water is placed in the tank once the water level is above the thermometer, then the temperature can be read and the tap water being used adjusted if needed. Do not fill the tank all the way to the top, but about two to three inches below to allow for water displacement from the rock, substrate and any décor. Once everything is in place, the tank can be filled about one inch from the top so you’ll be able to float new fish in their bags on top of the water. The correct water level in glass tanks is just to a point where you cannot see the top of the water from the side of the tank as it would be behind the plastic frame. Never fill a tank all the way to the very top. 6.) To get the water ready for any live sand, rock or livestock, put in the appropriate water conditioner and add the correct amount of ocean salt mix according to the manufacturer’s directions (which is usually half a cup per gallon). If needed, make up extra water with salt and water conditioner to fill a sump filter, as some of them may take many gallons of water to fill to the right level depending on their size. Swish the salt with your hands in the tank or bucket every five to ten minutes or so to get it to dissolve quicker. Running water pumps, power heads and in some cases filters will also help speed up the process. In very large tanks over 55 gallons, it may take an hour or two for all the salt to dissolve completely and give an accurate reading of the salt level (salinity). Once you are sure the salt has dissolved completely, use a hydrometer to check the salinity. It should be at least 1.021 for fish only tanks and at least 1.024 for reef tanks. It can be as high as 1.026, but should never be any more than this. If the salt level is testing low, swish the water around again and then wait a few minutes and check it again. If you are getting the same reading and is still too low, add more salt mix (approximately one half cup for every ten gallons or so of tank water to bring up the amount roughly .001 – take your time). If the salt level is reading too high, remove some of the salt water and replace it with fresh water until the right level is achieved. With all new water and salt mix, the pH should be correct at the beginning, but check it before adding any live organisms. Have buffer available to bring up the pH (and alkalinity) which will be more necessary as the tank gets older. Add buffer to the tank whenever the pH is reading lower than 8.2 as the pH in tanks, especially those with invertebrates, should never be below 8.0 or above 8.4 in the future, whenever you do partial water changes, buffer can and most likely needs to be added to the new water in the bucket (along with any water conditioners and of course salt that has had time to dissolve) to keep the pH up in your aquarium. 7.) Set up the filter according to the instructions. In most cases, filters need to be filled up with water before plugged in. Get the filter running smoothly and remember that most filter media, especially carbon if it is being used, must be changed every month as it will not work after this time. Any sponges, socks or pads need to be washed out, preferably with tank water, every month or as needed, and should not be replaced when worn, preferably not at the same time as the carbon or any other filter media being used, but after two weeks or so. With some filters, cartridges are used that are all in one can therefore be thrown out and replaced once a month. Filter parts, especially the impeller and impeller well, should be cleaned out every four months to keep the filter running properly. The above is also true for any power heads or other water pumps being used, as they should be for reef tanks, so their sponge protectors must be rinsed out as needed and the impeller and impeller well need to be cleaned out every few months. 8.) Place the fully submersible heater (or two as needed for larger systems – be sure they are the same wattage) in the tank. It can be placed low and horizontally on the back approximately one to two inches above the substrate after first setting the temperature to run in the high seventies or very low eighties as needed for most saltwater tanks. This way water changes can be done without worrying about the heater being exposed while plugged in and breaking, plus you can place rock or décor in front of the heater easily in this position so it cannot be seen from the front. The chiller, if one is being used, can also be set up at this time according to the manufacturer’s direction. Some chillers have a spot to place a heater or a heater is included, and so one does not need to be placed in the tank. DO NOT plug in the heater until it had been in the tank (and that’s why you do not want to fill the tank with cold water or hot water – if that happened you must wait until the water is at room temperature before plugging in the heater). 9.) Place live rock or other decorations into the tank if it hasn’t already been done in step 4 above. If setting up a reef tank so that at least a pound of live rock is being used per gallon of tank water, the largest rocks should be placed at the bottom with basically no substrate underneath them and slightly apart so other rocks can be placed on top of them to form caves. This is desirable not only for looks and to let fish and invertebrates move around the rock easily, but to let water flow around the rock to keep organisms in it alive and help slow down algae growth. When building a live rock wall, make sure that rock is locking together well and not rocking or moving at all as live rock should not be moved once in place. It can take hours to build a rock wall or piles correctly, as rock will sometimes need to be turned and turned and flipped and so on to get it to stay in place, so take your time. Clay cement that is safe to use in saltwater tanks is available but should only be used to stick on small rock with corals on them to bigger rock than cementing large rocks together as it may not hold well. Keep the rock wall and/or piles toward the middle back and far enough away from the front and side glass so that the glass can be cleaned easily. It is also best not to have the rock touching the back glass too much except as needed to form braces. Along with all this, and when possible, try to keep in mind to leave shelf like projections and areas to place the corals that you buy later. Even if the tank is a fish only tank and rock is not being used, it is important to have some décor, as it gives the fish some security if they feel the need to hide along with making the tank look great. There are many great looking plastic decorations and plants on the market along with some very real looking artificial corals. If you go with artificial decorations, be sure to have different heights with some reaching almost to the top to help break up the tank and will make it look a lot better than doing all short decorations. 10.) Place the hood or glass cover and lighting on the tank. You may need to cut or break out pieces on the back of the hood or cover to allow for a hang on filter or other equipment that goes into the tank. Try not to leave a lot of space open as that will allow more water evaporation and many fish are good jumpers. It is best to put the lighting on a timer, especially for reef tanks, so it is consistent in time and in the time of day it is on. Usually six to eight hours is fine for fish only saltwater tanks without corals, anemones or other livestock that needs light to live, and approximately twelve hours of high intensity lighting will work well for reef tanks with corals and so on. Lights need to be off at night as fish and invertebrates need darkness to sleep properly. You can, however, have the light go on during early afternoon and off in the evening a bit if you will be looking at the tank more before going to bed. For instance, a fish only tank (or one with invertebrates that do not need strong lighting like shrimp and crabs) can go on at 2pm and off at 9pm. With reef tanks, many light fixture have both bright white bulbs and blue (actinic) bulbs on separate switches. These can be put on separate timers so the actinic come on a half hour before and go off a half hour after the brighter white bulbs to act like sunr4ise and sunset. Both bulbs should be on together during the day (and if wanted into the evening a bit) for approximately eleven hours. Make sure to replace all bulbs (except LED’s – no replacement needed) no matter what type of tank they are on, every six to eight months as they will lose intensity over time and shift color temperature therefore causing more algae growth (and unhappy light-needing organisms). 11.) Check the temperature of the tank after a few hours, and the next day, to see if it is at the right level and staying there. Once the temperature is staying stable, you can start to add fish and invertebrates. There is no need to wait more than twenty-four hours after setting up a saltwater tank to place livestock in it, as it will not start cycle until live creatures are added UNLESS uncured live rock is used. Uncured live stock has organisms that are dying on it and the rock will have a definite bad smell to it. You cannot add anything to the tank until the rock has cured, which may take as long as six weeks. Keep checking ammonia and nitrite levels (and change water if they get high) at least twice a week in a tank with uncured live rock. Once ammonia and nitrite are reading zero, then you can begin to add livestock. If you do not wish to wait, then you must buy cured live stock (and some filter systems like refugiums should be set up on tanks that have used cured live rock only). When adding the first creatures to the tank, buy fish that are hardy (and preferably peaceful) and remember to only add one smaller (two inches or less sized) fish for every 15 or 20 gallons of tank water at the most! Ammonia is very toxic in the high pH environment of a salt water tank, so add little for fish and wait a good month in-between additions. If there is live rock, you can add a bunch of reef safe hermit crabs (about one for every two to three gallons) and small snails (about one for every 15-20 gallons) at the beginning to keep the rock clean. Hardy corals can be added to a tank once it has cycled with fish for a month along with other invertebrates that are fairly hardy. It is best to avoid any sensitive inverts, like some shrimps and starfish, until the tank has been running for at least three to four months.